Four police officers wounded in Sunday’s violence Timornewsline, July 15, 2012 - Four police officers were seriously wounded and one civilian injured during violence, after Xanana Gusmao’s party CNRT conference refused to form coalition with Fretilin Party. “Four police officers are seriously wounded, one civilian injured and 54 cars were destroyed in this incident,” he said on public TV [TVTL] last night. The National Police has declared zero tolerance after the violence broke out in the west of the country’s Capital of Dili on Monday (15/7). “In relation to today’s violence, the National Police command declared zero tolerance to any forms of acts of violence to be committed,” he said. Police Commissioner Monteiro also called on all the political parties’ leaders to control their followers to stay away from acts of violence, so that people can remain calm. He added that the UN Police and PNTL and the Timorese Defense Force (F-FDTL) would continue controlling the security situation in cooperation with all the communities. The Government of Timor-Leste decided to end the UN mission in Timor-Leste December this year after the security situation in the last few years was restored following the 2006’s east and west division violence broke out. FOKUPERS holds workshop on reproductive health and sexual violence prevention Radio e Televizaun Timor-Leste, July 16, 2012 language source: Tetun - FOKUPERS [a women's organisation] has held a one-day workshop to share information about reproductive health sexual violence prevention. The workshop also aimed at giving information to the women about how they could protect themselves in preventing any act of sexual assault which might happen to them in the future. FOKUPERS’ Representative Maria Jose Guterres said this seminar was very important for men and women toprotect themselves from acts of sexual violence. “It is very important for the men and women how they can take care of themselves, especially taking care of their reproductive organs,” she said. President TMR calls on PNTL and F-FDTL to continue providing security Independente, July 16, 2012 language source: Tetun - President of the Republic Taur Matan Ruak (TMR) has called on the Timorese National police (PNTL) and F-FDTL to continue maintaining the security up to the establishment of the new government. The State Secretary for Security Francisco da Costa Guterres made the comments after meeting with the president last Friday. “The president of the republic calls on strengthening the security in the potential conflict areas, so that the process of setting up the new government can go well,” he said. Guterres said the president also called on the police to continue having a dialog with the communities to maintain the peace and stability in the country. Violence erupts as CNRT excludes Fretilin from coalition Independente, July 16, 2012 - Violence broke out on Komoro’s streets yesterday shortly after CNRT decided to invite the Democratic Party (PD) and Fretilin Mudanca to form a new government, leaving Fretilin in opposition. A Komoro resident, who did not want to be named, said that after the CNRT conference at which the decision was made, hundreds of Fretilin followers gathered at their party’s headquarter and then threw stones at cars and motorbikes passing by on the public street. Eight people received treatment at the Dili hospital for injuries sustained in the conflict, a hospital spokesperson said. Journalists who were trying to get pictures of the violence were hit by stones, but not were badly injured. The police tried to calm the situation by blocking the street in front of Fretilin’s office. When this failed, they deployed tear gas and the crowd dispersed. 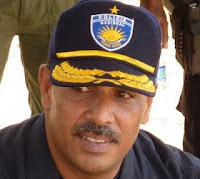 SIC continues investigating Marcelino Viana’s case Suara Timor Lorosae, July 16, 2012 language source: Tetun - The Timorese National Police (PNTL) through the National Investigation Service (SIC) will continue investigating Marcelino Viana’s Case, SIC Commander, Calisto Gonzaga said. “If the perpetrators of the killing have been identified, this case will proceed forward, otherwise it will be difficult for the police to process the case legally,” he explained. PNTL Operational Commander Armando Monteiro said the communities needed to cooperate with the police to uncover whereabouts of the suspected men. The 37-year old Viana was killed by the unknown people in April, in Akanuno, the eastern part of the Capital of Dili. Security situation at border under control Timor Post, July 16, 2012 language source: Tetun - An Immigration Police officer Jose da Costa said the security situation at the border during the legislative election was calm and under control. “Nothing happened during the process of the recent legislative election. The situation during the electoral process was under control,” he said. He added that the country’s border police had created strong cooperation to control the security situation in the area.